So if the Intensity Scale doesn't follow the Standard that is used in all consumer content then the colors and intensities will be inaccurate everywhere in all images. In order to deliver accurate color and image contrast a display must closely match the Standard Intensity Scale. 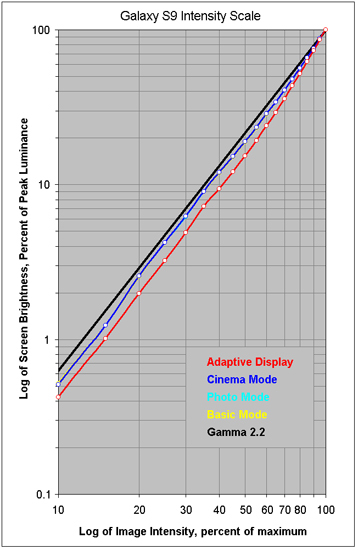 Figure 3 below shows the measured Intensity Scales for the 4 Screen Modes alongside the industry standard Gamma of 2.2, which is the straight black line. Note that the Intensity Scales for the 3 Calibrated Screen Modes are very similar and overlap on the graph. They are all slightly steeper than the Standard Intensity Scale. The Intensity Scale for the Adaptive Display Mode is steeper than the Calibrated Screen Modes, however, that improves the Image Contrast and Color Saturation in Ambient Light.